2 Pork sausages with onion gravy, mashed potato, carrots and peas in a cooked batter case. Succulent British pork sausages and mash in a crispy Yorkshire pudding. Our team of chefs carefully prepare all our meals with ingredients you'd find in your own kitchen. These comforting British Classics are warming, satisfying and full of great flavour. 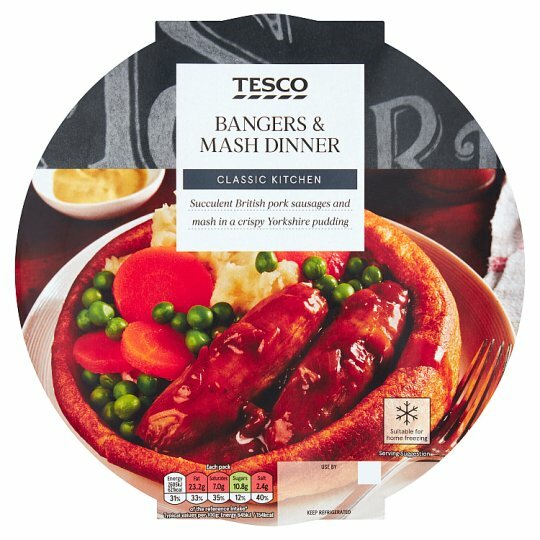 INGREDIENTS: Mashed Potato (28%) [Potato, Skimmed Milk, Whole Milk, Butter (Milk), Salt, White Pepper], Pork Sausage (18%) [Pork, Wheat Flour, Water, Salt, Rapeseed Oil, Dextrose, Stabiliser (Sodium Triphosphate), White Pepper, Parsley, Mace, Yeast Extract, Ginger, Sage, Nutmeg], Onion Gravy (18%) [Water, Onion, Cornflour, Tomato Purée, Chicken Extract, Rapeseed Oil, Muscovado Sugar, Caramelised Sugar, Wheat Flour, Garlic Purée, Vegetable Juices [Carrot, Mushroom, Onion], Sugar, Salt, Thyme, White Pepper], Wheat Flour [Wheat Flour, Calcium Carbonate, Iron, Thiamin, Niacin], Water, Peas, Carrot, Egg Blend [Egg White, Egg], Rapeseed Oil, Dried Skimmed Milk, Egg White, Salt, Pork sausages filled into pork casings. Instructions: For best results oven heat. 190°C/Fan 170°C/Gas 5 30-35mins Place on a baking tray in the centre of a pre-heated oven for 25-30 minutes. Remove film lid and heat for a further 5 minutes. Leave to stand for 1 minute after heating. Stir before serving. Peel back film lid, stir, re-cover and heat. Allow tray to stand until it regains rigidity. Follow the heating instructions above..